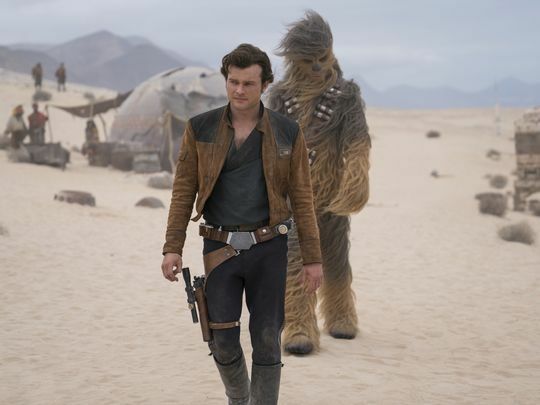 A new still image from the upcoming film Solo: A Star Wars Story was released online today by USA Today as part of their summer movie preview. The image features Alden Ehrenreich as young Han Solo standing with Chewbacca in a desert setting which was glimpsed briefly in the trailer that was released this weekend. Ehrenreich was also interviewed for the feature and he described Han's story in the film saying, "He's more of an idealist in hardscrabble circumstances, dreaming of a better life and all the adventures he's going to have. Part of the fun is watching him face reality and learn some hard lessons."